The OP Jindal School in Raigarh, Chhattisgarh, forms a part of the educational and cultural centre of the town along with the JSPL Auditorium and Amphitheatre. The school has grown in phases as the population of the town has increased, starting with the first phase commencing in 1998 to the fourth phase currently under construction. The first phase was designed with a tight budget which dictated the compact radial layout minimizing circulation spaces without compromising natural light and ventilation. The architectural vocabulary of the building adapted the local building traditions to modern materials and requirements. The traditional terracotta country tile was manufactured to modern specifications in collaboration with potters in the region. Traditional timber beams were replaced by steel trusses to achieve the large spans needed in classrooms; the steel for the building coming from the adjoining steel plant which also provided steel doors and windows. The walls and arches formed a load bearing masonry structure made of fly-ash bricks. Fly-ash bricks were manufactured in a factory specially set up for this project. This transformed waste fly-ash from the steel plant into a valuable resource. The fly-ash brick factory now supplies bricks for construction in the whole region and has been a model for more brick factories near other steel plants in the area. Subsequent phases of the school have increasingly showcased the steel manufactured in the nearby plant in the form of steel columns and light weight steel roofs. 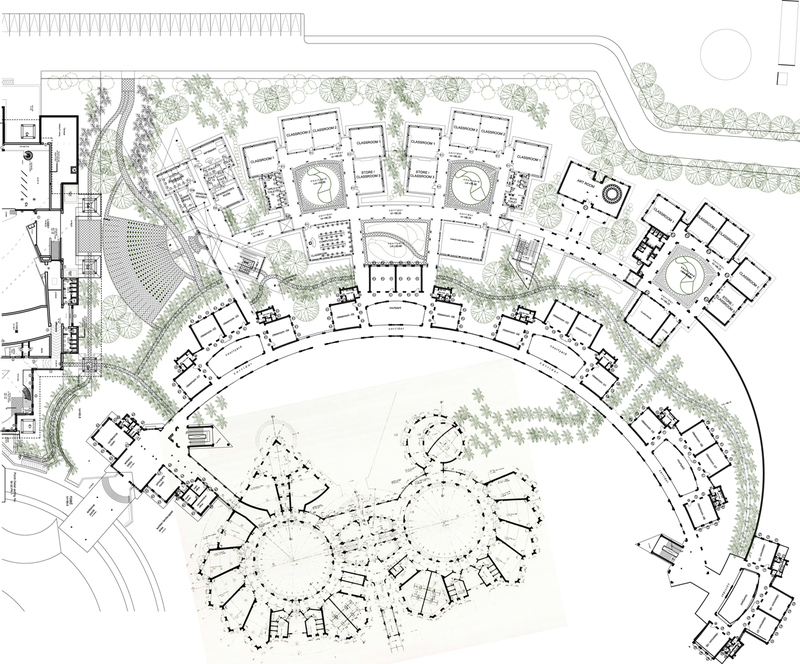 These phases have grown radially outwards from the first phase and have been designed as clusters around courtyards.